Kanye West’s hotly anticipated North American tour kicked off last week, in true Yeezus style – high octane and high fashion. With his tour wardrobe curated especially by creative director Virgil Abloh of Pyrex, featuring custom pieces by Maison Martin Margiela, it’s only expected that the tour merchandise would be as outspoken as the rapper himself. Staying true to a statement he made in that BBC One interview – i.e. “I am the Number One rockstar on the planet” – the tour shirts are very ‘80s Americana, rock-and-roll tee. Designed by Cali-based artist Wes Lang, the imagery is expectedly controversial, with skeletons, undead Indian chiefs and Confederate flag based styles all in the mix. And now you can cop your own piece of Yeezus tour merch, if you’re local to the Los Angeles area. 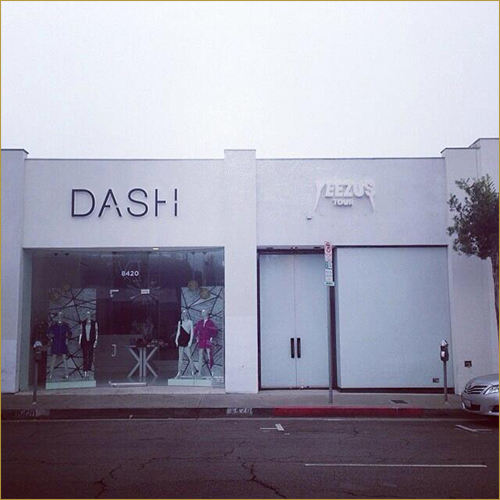 Continuing the Kanye-Kardashian collab that is now his life, Yeezus set up (pop-up) shop directly next to the in-laws’ Dash boutique in Los Angeles. The temporary store has been fitted very minimally inside and out, and stocks all three tour shirt designs, as well as other Yeezus merchandise, including sweatshirts, trucker caps and tote bags. You can take a look at the shirt and shop designs in our gallery above.